It is important to allow the young horse to move forward freely so that she can feel you preparing her for the change of direction. Notice I start on the left rein and I am bumping the right rein to maintain impulsion. As I prepare to change direction I allow my left rein to slide through my hand as I say “hello” on the right rein. As I begin begin traveling to the right I am bumping my left rein to keep her out on the circle. If she has learned respect for my space she will yield to that inside rein and stay out on the circle moving forward freely. As I prepare to change from the right to the left I allow the right rein to slide through my hand as I say “hello on the left. 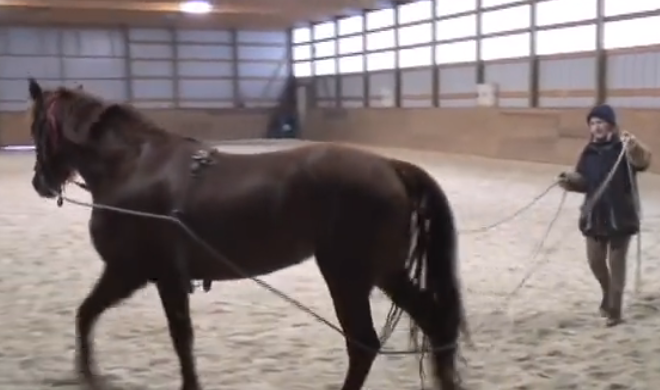 It is extremely important to help your horse continue to move forward as you prepare her for the change of direction.